Northern Ireland’s education system is under “considerable strain” and faces “severe financial challenges”, according to a senior civil servant. The Department of Education’s top official, Derek Baker, made the comments in the accounts for 2017-18, which have just been published. 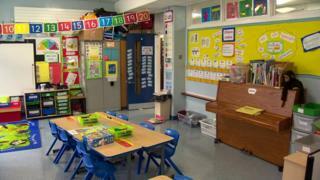 The Education Authority overspent its budget by about £19m last year. That is mainly due to increased spending on schools and pupils with special educational needs. It follows a similar overspend by the Education Authority in 2016-17 for which it was criticised by the Northern Ireland Audit Office. Mr Baker said that schools were facing unprecedented pressures and an increasing number were moving into financial deficit. “Schools spend 90% or more of their budgets on staffing costs, which have increased year on year as a consequence of pay inflation,” he wrote. “School budgets have remained flat in cash terms for a number of years. He added that it was “clear” that pressure on school budgets, increasing numbers of pupils and other issues meant the “system is under considerable strain”. Mr Baker also said that the implementation of a number of key education policies has been delayed due to the lack of a Northern Ireland Executive. Those include the children and young people’s strategy, childcare strategy and looked after children’s strategy. Mr Baker took decisions on 32 school development proposals in 2017-18. Those included closing five primary schools and one post-primary and approving two amalgamations involving five post-primary schools. However, the department has previously said that it is taking too long to close and merge unsustainable schools. Mr Baker also revealed that there had been a delay in implementing measures contained in new legislation to combat bullying in schools. That is mainly due to the need for a new IT system in order for schools to record all incidents of bullying. The department spent almost £2.2bn in 2017-18. That is about £1m less than in 2016-17. Just under £1.2bn went directly to schools, which was about £20m more than in 2016-17. The Education Authority received £599m to provide services to schools – including transport, meals and maintenance – and support for children with special educational needs.